As a congregational project this school year, we are collecting money to support literacy. A part of that project is a bi-lingual library for Tower Rock Elementary School. St. John’s Staff issued a CHALLENGE to the congregation to raise the $1000 dollars for Tower Rock’s library by December 23! If $1,000 was collected, Pastor Sally and Pastor Fred would wear their least favorite football team’s jerseys on a Sunday in January. In the midst of this, a community member was inspired to match our gifts, up to $2500, by the end of 2018. You did this and more! We gathered over $3000 by the end of the year and, as of March, have now collected over $7000! Lots of books and resources will fill several libraries in the Sauk-Prairie School District. 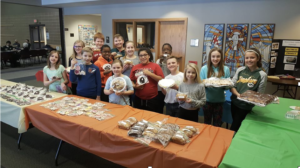 We are grateful that St. John’s is a generous congregation. By the way, if you want to see pictures of the pastors in their football jerseys, look at our Facebook page. 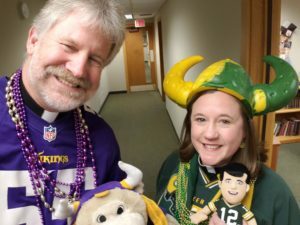 Pastor Sally wore a Packers’ jersey and Pastor Fred wore a Viking’s jersey. 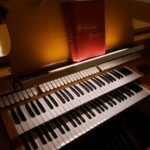 St. John’s is seeking an individual who will serve as our organist and/or choir director. The position is 15 hours/week. Major responsibilities include playing for Sunday worship and/or conducting two choirs (two adult choirs). Position is currently open. Send applications to St. John’s Lutheran Church – 100 Oak Street, Prairie du Sac, WI, 53578. Contact Rev. Fred Rilling at fred@stjohnssaukprairie.org for more information.